Last Hero in China sprawls, but not without a certain style. The movie opens with the abduction of four runaway slave girls at the hands of a giant levitating lampshade with an extendable grabbing claw. Inside sits evil monk Gordon Liu whose horny Nun-yan Temple – full to the brim with Boxer Rebellion outlaws – kidnap Chinese maidens and sell them to the highest bidder. Not content with that, Wong Jing throws in a manic kung fu dignitary with a laugh that matches his bite and a selfish desire to take over the land. 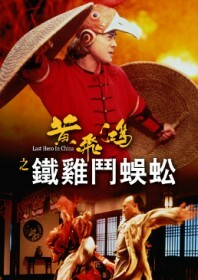 Then there’s Jet Li reviving his Wong Fei-hung role as the last hero in China left to save everyone from this mess. The fact it is played as a comedy undermines a lot of the film’s sincerity. Skits involving a neighbouring brothel and Wong Fei-hung’s incompetent students act to unhinge the story, wildly setting the film apart from its main inspiration: Tsui Hark’s Once Upon a Time in China. The film is at its best during the fight sequences (choreographed by Yuen Woo-ping). A dimly-lit broken bridge is the setting for an exquisite showdown between Wong and the mad monk, designed like ritualistic pugilism and featuring Fei-hung’s trademark No-Shadow Kick. The ludicrous finale, where Wong Fei-hung attaches a beak to his forehead and unleashes deadly realms of chicken-style kung fu on a giant centipede, is completely surreal, before ending in a furious Drunken Fist finale upon bamboo scaffolding. It does, in fact, emerge as something of a lighthearted treat.